Alright Alright Alright, was a number 3 hit in the summer of 1973 and blasted Mungo Jerry back into the charts. The single was a big surprise to most fans as they were expecting Say Goodnight, a track that appeared on the Greatest Hits album, to be the single. Radio 1 were playing Say Goodnight and even announced it as the new Mungo Jerry release. What a great choice the rocking ‘Alright’ proved to be as it raced up the charts to peak at number three, only denied the number one slot by Peters and Lee and one G. Glitter! Tracks: Alright Alright Alright/Little Miss Hipshake. “I was really pleased with the track, it was good to come back with such a big international hit”. Alright boys, it’s alright. I mean it’s not drivel or a work of genius. It kind of gets you going with a two beat riff and jolly vocals and it’s probably their best chance of a hit since the great days of…In The Summertime. My God, can it really be three years ago since Hollywood Festival? . Well we haven’t seen this merry group in the chart for several long months. No doubt many people will be glad to see them return with their very own recipe of cheerful pop. As someone remarked to me this week, “What a summery sound this group have.” And they’re right, Mungo have become as much a part of the British summer as Wimbledon fortnight or Henley. This particular song is a happy bouncy work, which is both simple or effective. It opens with a brief instrumental phase, followed by some high pitched hooting vocals, after which the verse starts. Uncomplicated lines such as “some say that, some say this, some say no and some say yes” ensure that all types of people will understand it. Idiots, complete idiots and even singles reviewers should have no difficulty. Recently discovered is this rare clip, believed wiped, of Mungo Jerry performing Alright Alright Alright on Top Of The Pops in 1973. With Ray are Johnny Cook on piano, Bob Daisley on bass and Tim Reeves on drums. Tim had replaced Paul Hancox as drummer when Paul broke his ankle stepping down from the stage onto a chair before a gig at Cardiff Castle – he still managed to complete the show. Tim became known as the only guy to be sacked TWICE from the band – “if I was Ray, even I would have sacked me” he said years later! 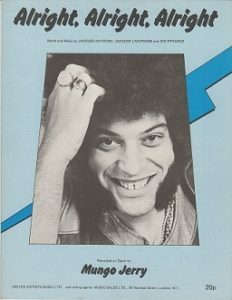 There are two brand new DVD’s – 24 Days, the Mungo Jerry documentary filmed during a tour of mainly Germany in 2016 and a live performance from the Bansko Jazz Festival. 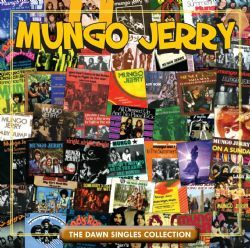 Both are available from the official Mungo Jerry shop.